There is significant evidence for the existence of worldwide increase of obesity in children. The problem is not only confined to developed countries; as there has been significant increase in middle and low income countries, and Saudi Arabia is not an exception. The problem of obesity in developing countries further impacts on the burden of disease in these countries. Individual nations need to be informed of the magnitude of the obesity problem in their different settings and an effective comprehensive approach including, formulation of effective health policies and health legislation development will enable development of long-term measures that address obesity epidemic. This article highlights the magnitude of obesity in Saudi Arabia and attempts to suggest policies and strategies potential to addressing obesity problems in Saudi Arabia. 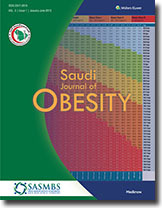 Multiple determinants of obesity are discussed related to the Saudi context. Aims: To determine the outcome of patients in terms of reduction of body mass index (BMI), gastric leak, and bleeding after laparoscopic sleeve gastrectomy. Setting and Design: This was a descriptive study, and the data was collected retrospectively in Dubai Hospital, Dubai, United Arab Emirates. Materials and Methods: All patients who underwent laparoscopic sleeve gastrectomy from April 2012 to July 2013, were included in the study. Multiple parameters were studied, including demographic features, BMI, and comorbid conditions of these patients. The duration of surgery, and reduction of BMI at 3, 6, and 12 month's duration after the surgery were calculated. Postoperative complications, including gastric leak and bleeding were also analyzed. The data was expressed as frequency, percentages, and mean ± standard deviation. Results: A total of 100 patients with mean age of 34 ± 8 years were included in the study. There were 21 (21%) male and 79 (79%) female patients. The mean BMI was 46 ± 6 kg/m 2 . Sixteen (16%) patients had diabetes mellitus, 19 (19%) had hypertension, nine (9%) had joint pain, six (6%) had back pain, and three (3%) patients had sleep apnea as comorbid conditions.Thirty-two (32%) patients had high blood cholesterol level, six (6%) patients had asthma, and seven (7%) patients had gall stones. Five (5%) patients had gastric band removal and two (2%) patients had history of laparoscopic cholecystectomy in the past. All patients underwent laparoscopic sleeve gastrectomy. The mean hospital stay was 3 ± 1 days, and mean duration of surgery was 80 ± 23 min. Five (5%) patients had laparoscopic cholecystectomy, and two (2%) patients had umbilical hernia repair at the same time. The mean BMI after 3 months was 41 ± 6 kg/m 2 , after 6 months was 37 ± 5 kg/m 2 , and after 12 months was 32 ± 5 kg/m 2 . Complete resolution of diabetes was observed in 11 (68.8%) patients and improved in six (31.2%) patients, resolution of hypertension in 11 (57.8%) patients and improvement in eight (42.2%) patients, and joint pain resolved in six (66.6%) patients and improved in three (33.3%) patients. Sleep apnea resolved in all three patients. Blood cholesterol was normal in 18 (56.3%) patients and improved in 14 (43.7%) patients. Postoperative bleeding occurred in four (4%) patients, and there was no leak in this group of patients. The mean follow-up duration was 13.6 ± 3 months. Conclusion: Laparoscopic sleeve gastrectomy is an effective procedure for reduction of BMI in obese patients. This results in resolution and improvement of obesity-related comorbid conditions in majority of patients. There was no gastric leak in this group of patients. Background: Obesity and overweight are associated with significant health and health-related conditions, which have a negative impact on the quality of life. Objectives: To determine the proportion and characteristics of obesity among adults visiting a major family practice center in central Saudi Arabia and to compare the demographic and health-related conditions among obese and nonobese adults. Materials and Methods: A cross-sectional study conducted in a major family practice center in Riyadh, Saudi Arabia. Patients attending the center between 1 st September and 30 th November 30, 2013 were interviewed using a data collection form developed to meet the objectives of the study. Logistic regression was used to generate the odds ratios and their 95% confidence intervals for the association of body mass index and risks factors. Results : A total number of 300 adult participants were included in this study. 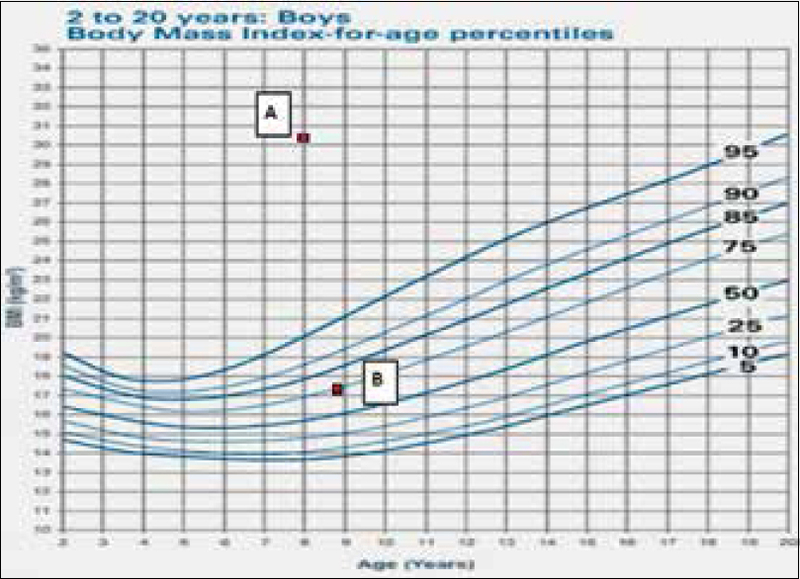 The mean age and standard deviation were 46 years (±17 years). The proportion of overweight and obesity in the total sample was 32% and 50% respectively. Frequency of obesity was found to increase with age till the age of 50 where it drops afterward. Obesity significantly affects the participants within the age group from 40 to 60 more than other age groups (P < 0.001). Obesity was significantly associated with female gender and marital status (P < 0.018 and 0.006, respectively). The presence of obesity was found to decline significantly with increasing level of education. The presence of obesity was more in patients who have other chronic medical problems and those who reported less exercise. In addition to nonsmoking status, stepwise multiple logistic regressions showed that low level of education and having chronic medical diseases especially hypertension could be considered as predictors of developing obesity. Conclusion: This study confirmed previously published data about the seriousness of overweight and obesity among adults in Saudi Arabia. Certain patient categories are at a higher risk as women, married, and less educated patients. The positive role of education was clearly demonstrated and highlights the important role in effective health education strategies to minimize the negative public impact of obesity and overweight. Background: Few studies have been published on histopathological findings in patients who underwent laparoscopic sleeve gastrectomy (LSG). However, no study has been published from Jordan, addressing the main histopathological findings for patients who underwent this procedure. Objective: This study aims to identify the patterns of gastric pathology among patients underwent laproscopic sleeve gastrectomy in Jordan. Materials and Methods: A retrospective review of histopathological results was performed for 150 patients who underwent LSG at Jordan University Hospital from 2008 to 2012, performed by a single surgeon. All the specimens were examined at the Pathology Department of Jordan University Hospital. Results: The average age of patients was 34.6 years and mean body mass index (BMI) was 45.1. Females represented 79.3% of all patients. Chronic gastritis was found in140 patients (93.3%), and Helicobacter pylori (H. pylori) was found in 51.3% of patients. Conclusion: In Jordan, chronic gastritis is most common in obese patients who underwent LSG. This finding supports previously published papers that focus on the importance of examining specimens postoperatively, also addressing a possible relation to the geographical area. Obesity is a common health problem in pediatric age group particularly in a society that is not practicing healthy lifestyles. The early detection and management of obese children can prevent later complications of obesity. The number of patients undergoing bariatric surgery increases every year, as obesity has become a major cause of several comorbidities. The frequency of complications associated with this procedure has been increasing. Here, we present a case of 32-year-old male with ataxia and peripheral polyneuropathy after a sleeve gastrectomy procedure, who went on to develop progressive weaknesses in the extremities within a duration of 8 months after surgery, and was admitted to hospital for neurological consultation and treatment. The case report highlights the symptoms that bariatric surgeons must detect and review the treatment. Portal vein thrombosis is a rare and life-threatening complication following surgery. Extension of thrombosis with involvement of the mesenteric vein is rarer. There have been some case reports documenting successful management of portomesenteric venous thrombosis (PMVT) following laparoscopic surgery. This case report describes a patient developing extensive hepatic and bowel infarction due to PMVT following laparoscopic sleeve gastrectomy.